Every optionable stock has an options expiration date. This is the day where all option contracts for the month become invalid and the rights to exercise them no longer exist. For option buyer (holder), this is the last day where you can exercise your rights on the option or allow the option to expire worthless. For option seller (writer), this is the last day where you may received assignment of the option or earned the full sum of premium collected. Every stock with listed options contracts expired in one of the following three fixed expiration cycles. There is no specific reason which cycle a stock is assigned to. It is purely random. Click here to ask a question or discuss in more detail with fellow traders on the topics relating to options expiration dates. At any given point of time, there are at least 4 different expiration months exist for each optionable stock. This is mainly due to the way options contracts are first set up in 1973, where the only expiration months exist belong to the months in which the fixed expiration cycles that individual stock is assigned to. After options trading become more popular, the nearest two months also have listed options contracts as well. However, at any given time, the longest-term options expiration dates are normally not more than nine months. Longer-term options, called LEAPS (Long-term Equity Anticipation Securities), are available for some stocks. Therefore, in any cycle, options may expire in 2 to 3 of the 4 major month (cycles) plus the near term months. Let’s take Ford Motor Co. (F), a company that is in the “March/June/September/December” cycles as an example. On August 1, 2018, F may expire in the following month: August 2018, September 2018, October 2018, December 2018, January 2019, March 2019, June 2019 and January 2020. It touch all 4 (September, December, March and June) of the 4 major month (March/June/September/December) in the third cycles. In the above example, August 2018, September 2018, October 2018 and December 2018 are the short or near term option; March 2019 and June 2019 is the far or long term option. The LEAPS option on F will expire in January (ie January 2019) next year and in January 2020 as well. 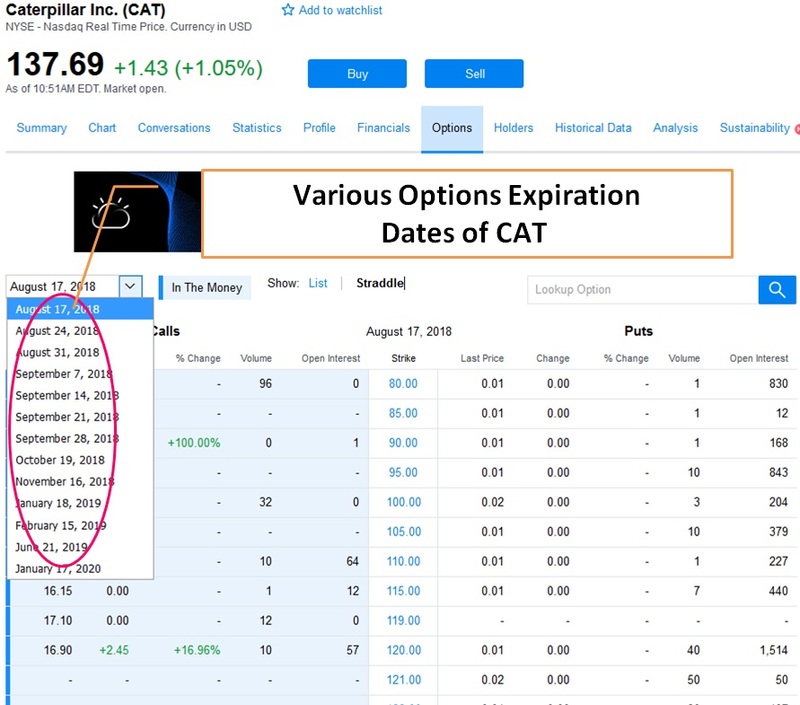 Below is an example for Caterpillar Inc. (CAT). Can you identify which expiration cycle does CAT belongs to? Answer: The February/May/August/November expiration cycle. Reason: August 2018, November 2018 and February 2019 expiration dates are shown. September 2018 and October 2018 is the near term expiration dates. January 2019 and January 2020 is a LEAPS. As there are no fixed patterns which cycles a stock will be assigned to, we can only guess from the existing expiration months that are available for trading. One trick to remember is to look at the third expiration month of the stocks. If it belong to November, it belong to the second expiration cycles. This fixed Expiration Cycle on individual stocks can be either a problem or an opportunity. It all depends on whether you are an option buyer or seller and the specific option investing strategies that you employ. The exact date of expiration is fixed within each month. 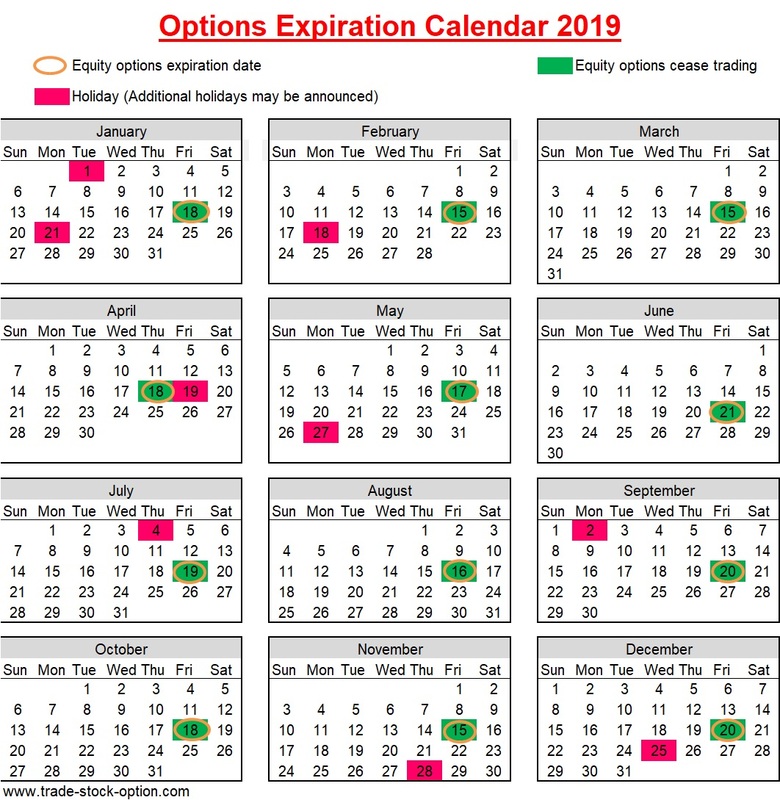 The last trading day for an option is the third Friday in the expiration month. Although the option actually will only expire on the following day (ie Saturday). A public customer must invoke the right to buy or sell the stock by 5.30pm, New York time, on the last day of trading. However, with effect from February 2015, the options expiry date will be shifted from third Saturday to third Friday of the expiration month. In this case both the last trading day and expiration day will be the same. This is an effort to standardise the monthly options with the current practice of weekly & quarterly option. More information can be found at the announcment made by Options Clearing Corporation (OCC) on this issue. Nonetherless, to close an open option position, an order must be placed and executed no later than the last trading day before the expiration date and before the expiration time for the option. The week that options expired is usually more volatile as options holders begin to exercise their options contracts or roll forward their options to ones with later options expiration dates. Generally, it is not advisable to place order to buy or sell the expiring options after 3.30pm of the last trading day. In the final minutes of trading, even a market order may not have enough time to get executed. 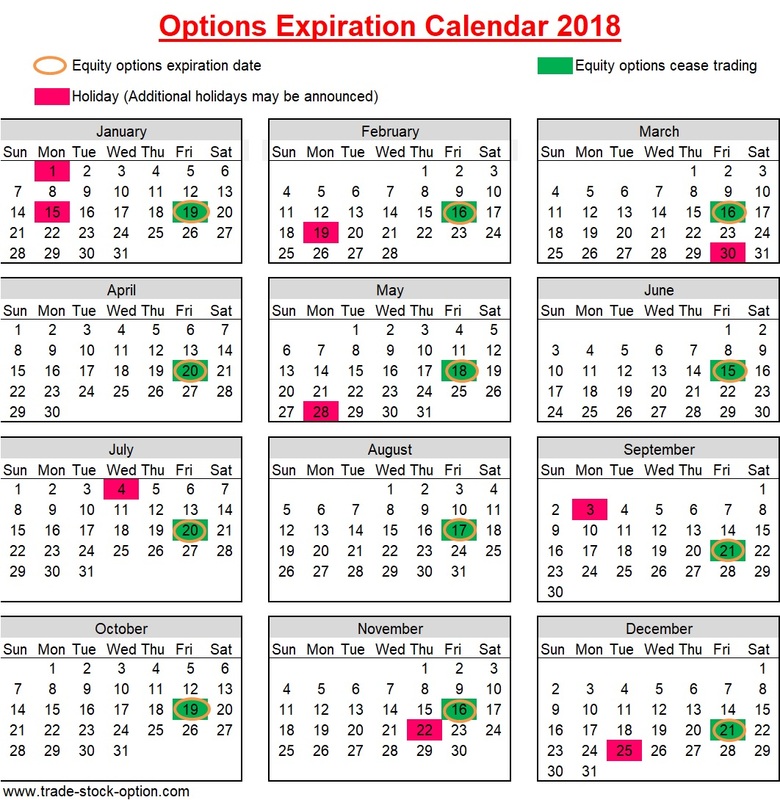 The options expiration calendar 2018 and options expiration calendar 2019 are as follows. You may print it out and paste it near your trading table so as to remind yourself on these important dates. Next, find out how Options Strike Price is determined in each option contract.